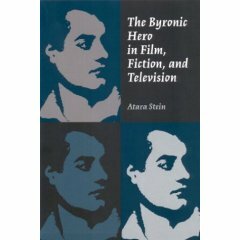 Atara Stein wriote a book about the Byronic Hero in popular culture (too early for House to be included): The Byronic Hero in Film, Fiction, and Television. and sees the character of House as fitting that model. House "fits the archetype of the Byronic hero, a type Byron didn't necessarily invent, but perfected, and which has had a huge influence on subsequent popular culture. In short, the Byronic Hero is an outlaw who follows his own moral code and has contempt for the rules and laws and conventions of society. He is moody and brooding, narcissistic, and isolated, often choosing to be alone and feeling isolated within society. He has supernatural or superhuman abilities or abilities that seem almost superhuman; one example is the Western hero who never misses a shot. He's a misanthrope, feeling superior to most of the human race, and avoiding contact with them. His social skills are pretty much nonexistent, and he often is separated from the woman he loves. He sees her as a superior being like himself and a mirror/soulmate, but he cannot be with her. She usually, but not always, ends up dead, often because of his narcissism. He's not physically wounded, but he is depressed in a big way, and he sees his depression as a mark of his superiority to other humans--his suffering is on such a higher level."